A recent Friday 13th article published by the Australian Financial Review carried news that Walker Corporation's 2-12 Batmans Hill Drive or Tower 5 had received approval from the Victorian State Government. Inauspicious dates aside and somewhat incredulously the Monday thereafter, deep foundation contractor Vibropile was on site, beginning construction on what is the sixth building within the Collins Square precinct. This miraculously quick turnaround suggests that Walker Corporation's dialogue with government representatives had been positive prior to public approval, prompting the developer to ready the necessary contractors to begin works immediately upon approval. 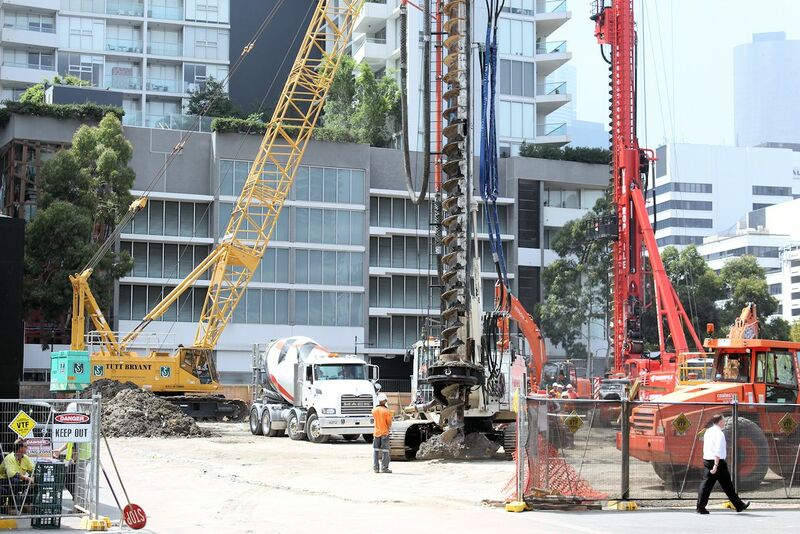 While piling has commenced, a head contractor has not been announced as yet. Covered by Urban Melbourne when at planning, 2-12 Batmans Hill Drive features a swale taken from the tower's most prominent aspect facing Wurundjeri Way. Described as a 'signature' tower in a key location and visible to the masses of commuters entering Melbourne via the Westgate Freeway, 2-12 Batmans Hill Drive will stand at 111 metres upon completion and add 34,700sqm of premium office space to the Melbourne market. 2-12 Batmans Hill Drive joins fellow Collins Square tower 727 Collins Street at construction, with the latter destined to be one of Docklands tallest buildings at 145 metres upon completion. 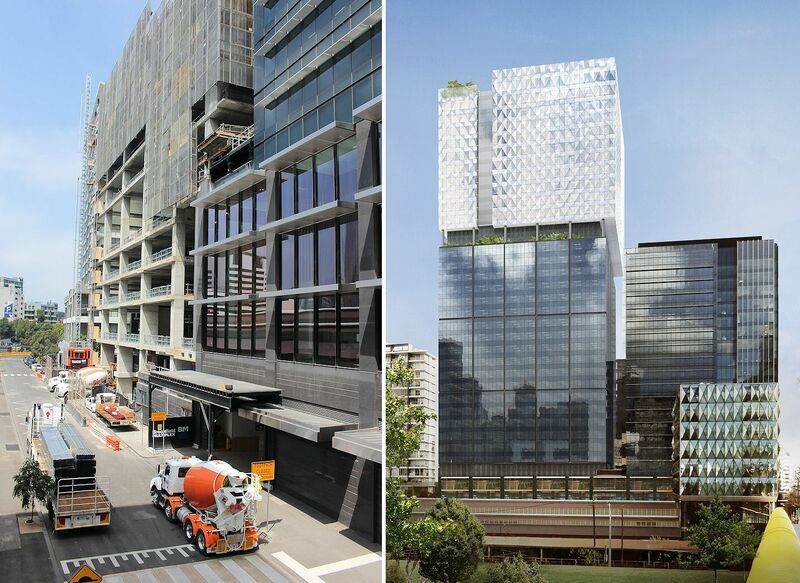 Together the two towers will add 90,000sqm of commercial space to the precinct. Further both buildings when complete will see contiguous retail spaces joined to create a cavernous and highly activated retail precinct at ground level, including a new internal passage dubbed Walker Laneway. Spotted in recent days atop Collins Square Tower 1 are the initial test facade panels which will eventually provide 727 Collins Street with its distinctive facade and 'crown'. Far from silver in appearance, the seemingly blue faceted panels will clad the top volume of the tower and are quite similar to the Sissons-designed Lantern Building seen above, which acts as the entry point to the Collins Square precinct. Externally the building exhibits two distinctive forms with a rich façade expression resulting from the varied materials and finishes. The lower east elevation offers a particularly well resolved and carefully detailed façade proving a strong presence to Village Street. To the upper levels the building provides an overhang to the north and west, providing an interesting architectural form. 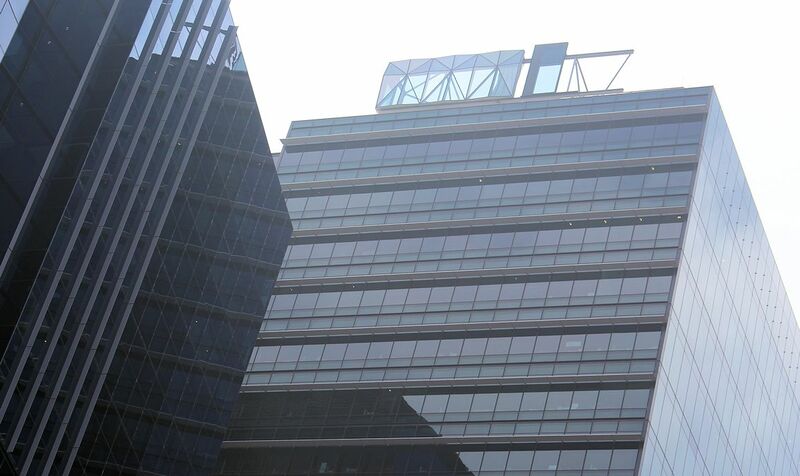 While no tenants have been made public for 2-12 Batmans Hill Drive, a number of organisations are seeking new office digs with the Sate Government (25,000 sqm) and Herald Weekly Times (11,000-13,000sqm) headlining the list. It could be that Walker Corporation intend to press ahead with construction of 2-12 Batmans Hill Drive in the hope that they may steal a march on competing prospective office developments. 727 Collins Street on the other hand has both KPMG (27,000sqm) and Maddocks (6,000sqm) as signed tenants although the AFR article cited earlier suggests that the tower will not be ready until the early stages of 2017, a delay of some months.